I had some leftover Barley Risotto – for fun, I call this Basotto – with turmeric and kale from yesterday and today I combined it with some chickpeas to make a substantial salad. 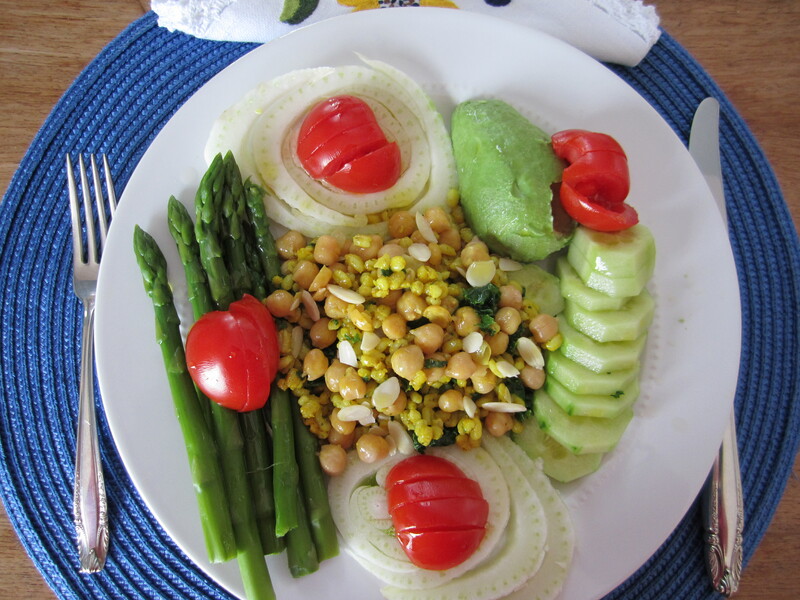 I accompanied it with asparagus, fennel, tomatoes, avocadoes and cucumbers and added some sliced almonds. As usual, I added olive oil and apple cider vinegar. This dish looks amazing and I like all the ingredients. Is there any other kind of dressing that could go well with this salad? Thank you Maria del Carmen for your comments. I am very happy that you like this dish and I have to tell you that a balsamic vinegar dressing goes very nicely as well! I am sorry for the delay in replying to your enquiry!